Even before Clay Travis’ new site came online this summer, 2011 already had seen the unveiling of an even bigger sports blog. The Sports Guy, Bill Simmons, brought his ESPN Page 2 act above board and began directing an ESPN.com side project called Grantland, named for Vanderbilt University graduate and early 1900s sportswriter Grantland Rice. In May, the New York Times declared Simmons “the most prominent sportswriter in America.” I remember being pretty surprised to read those words, and then thinking, well, maybe that’s right. Sports Illustrated Rick Reilly would’ve had something to say about that a few years ago. Mitch Albom probably is part of a generation being supplanted– or at least his hair is. Simmons had seized the internet and the kids’ attention thereby. He had a popular web column and podcast, and a bestselling book. The NYT declaration probably was correct, but it was strange to read it in print for the first time. Grantland would find Simmons in a new role, or more accurately, an additional role. ESPN wanted him to keep up with his podcast and column, migrating that content to the new site. In addition, he was to serve as editor in chief. With that as a general goal, I think Grantland has mostly succeeded. Organizations mirror their leaders, and Grantland shares some of Simmons’ prior struggles. Those who want to get into the site probably feel that there isn’t enough content on the site, and Simmons himself seems to publish infrequently. And even though the internet now runs 24/7, don’t look for new content over the weekend: this is a M-F group. Overall, though, the quality of the content is high, and it certainly bests the competition. The plain aesthetic is pleasing and professional, and the long-form pieces often are engaging and refreshing. Sometimes they read like young but talented writers just showing off, but other times they’re really solid. (For example, Anna Clark’s Detroit/Ty Cobb profile, or Chuck Klosterman’s tale of junior college basketball in South Dakota) A nice touch is the offsetting of the longer, less frequently posted articles with two blogs, The Triangle (for sports) and Hollywood Prospectus (for pop culture), with shorter, more frequent posts. The National had the best editors and writers, the most money, and the newest technology of the day. 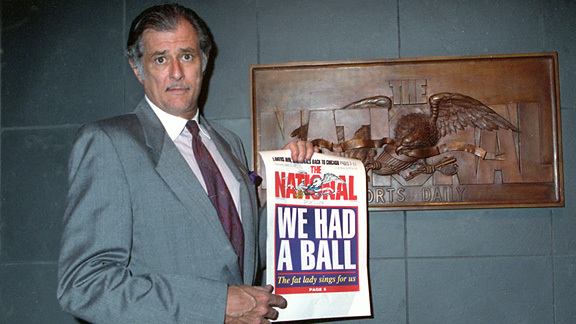 How the Supertramp of sports publications came into being, operated for eighteen months in the early 1990s, and folded to the dismay of some and delight of others is a fascinating tale, and French and Kahn’s oral history is a compelling read. Similarly, Charles P. Pierce’s “My Memories of The National“ nicely complements French and Kahn’s assemblage, trading the top-down perspective for a personal view of “the greatest job he ever had.” Even more than Simmons’ own introduction to the site, these two pieces served (implicitly) as an introductory statement of intent for the new venture. The second example was the one that made me think back and realize that writing about writing was Grantland’s forte. On July 13, Michael MacCambridge offered a “director’s cut” of Tony Kornheiser’s profile of Nolan Ryan, originally published in a 1980 edition of Inside Sports magazine. Like a director’s cut DVD, MacCambridge’s post provides an introduction contextualizing the original work, interrupts the flow of the subject article with Grantland’s footnote-esque sidenotes to provide modern commentary from Kornheiser and other annotations, and appends a concluding epilogue. Just as with a film presented in this way, the underlying material of course has to be strong. When it is, as it is here, the “director’s cut” treatment adds a new layer of insight and information that makes the article that much more fun to read. Grantland has its critics, but I think it has become the Sports Illustrated for the Kindle era, and I look forward to more from them as the group finds its identity. This entry was posted in ALDLAND and tagged bill simmons, blogging about blogging, espn, grantland, supertramp, the national, vanderbilt, writing about writing by AD. Bookmark the permalink.